The new Ballard bistro Samara cooks all of its meat and seasonal produce in an applewood-fueled brick oven and hearth. 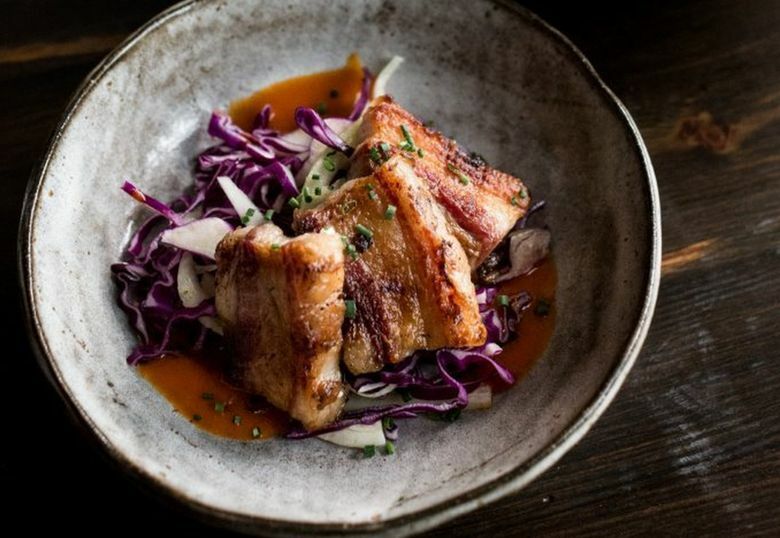 Pictured here is grilled pork belly served with salted fennel, red cabbage and cherry bomb (Courtesy of Danielle Motif). A big name hot pot spot lands in Bellevue, the U District gets more Chinese food and the food explosion continues around SLU. Samara is a 36-seat Ballard bistro from chef Eric Anderson, formerly of Palace Kitchen and Brunswick & Hunt. The New-American cuisine in the Sunset Hill ‘hood focuses on heritage-breed animals and sustainable seafood and uses only an applewood-fueled oven and hearth as its cooking source. Like all the cool kids these days, Samara’s drink program focuses on biodynamic and natural wines including Oregon-based A. D. Beckham wines, which have gained a cult following around Seattle in recent years. A mile north of Samara sits Lucky Santo with a focus on nondairy and “low grain” dishes for all your keto, paleo and gluten-free needs. Chef Nikki DeGidio has worked at Campagne, the late Marche and Bastille. Lucky Santo has some big-name backings: along with part owner DeGidio, the project is also backed by chef Jason Stoneburner and the couple behind the acclaimed Captive Spirits, Holly Robinson and Ben Capdevielle. The latest rounds of openings around Amazonland: Jack’s BBQ, which helped introduce Central-Texas style BBQ brisket to Seattleites, has expanded to South Lake Union. There are breakfast tacos for the early birds. Mala & Satay does pho, banh mis, vermicelli bowls and other Vietnamese comfort food on the ground floor of a new mixed-used development along Fairview Avenue North. (Don’t confuse this spot with Malay Satay.) Next door is Urban Gyro. Three blocks north of Urban Gyro is the Indian café Lassi & Spice, which does samosas, chaat, crumpets and chutneys. Bounty Kitchen is now in the Denny Triangle. It’s an expanded version of its upper Queen Anne spot, with a juice-and-espresso bar, grab-and-go sandwiches and happy hour. The University District has seen an influx of new Chinese restaurants. The latest is BC Zhang, hawking Beijing-style crêpes stuffed with ham, beef and chicken. There’s also Little Duck, which does twice-cooked pork, pickled cabbage and other northeastern Chinese cuisine. Nearby are Koa, a Hawaiian restaurant and Boba Up, a self-serve bubble-tea spot. The Chinatown International District welcomes Luosifen, which specializes in its namesake rice-noodle soup from the southern region. Try the hog house special soup with crispy pork skin, barbecue pork, pork feet and a brined egg. Ordering this spicy is the only way to go. The heat works nicely to round out the funky, earthy pork-snail broth. It’s a hearty serving for $10.99. If the thought of eating pig feet is horrifying, swap it out for one of a dozen other options such as the braised beef brisket. For those less adventurous, hit the nearby bar restaurant Gan Bei, which boasts a 67-item-menu (from chow mein to the decadent lobster-and-crab fried rice). Seattlelites who have been trekking to Tukwila and Lynnwood for the bread and sweets at 85°C Bakery Café, you now have a closer outpost at South Jackson Street and Fifth Avenue South. Bang Bang Kitchen opened a half block from the high foot-traffic area of the Othello light-rail station, turning the former Mexican restaurant space into a New Mexican cuisine joint. The burger comes with hatch chilies. And its Frito pie is sure to be an Instagram hit. This project comes from the same owners as the breakfast burrito joint Bang Bang Café in Belltown. This 2.0 version is a more ambitious, full-service restaurant with a tequila bar and two televisions to draw the locals on game nights. On Capitol Hill, Zeeks Pizza opened its 16th location at the elbow of 19th Avenue East and East Mercer Street with an impressive craft-beer lineup. Pho Huy opened along East Madison Street, doing all the Vietnamese staples: banh mis, spring rolls, vermicelli noodles and its namesake beef soup. In lower Queen Anne, or as some call it, “Uptown,” Moontree Asian Sushi and Tapas relocated from Everett. Caffe Limoncello offers espressos and pastries — and soon, pasta and sandwiches. Around downtown, Mighty-O Donuts has expanded with a fifth location, and Sodo’s Fulcrum Coffee opened Mountaintops Café in the Insignia Towers. The Central District banh-mi spot Mr. Saigon has expanded to downtown and is eyeing a third location in Pioneer Square. And speaking of Pioneer Square, Lady Yum expanded near Occidental Square in a space that’s three times bigger than its other macaron outposts. There are beers, espressos, grab-and-go sandwiches and desserts. The plant-based, gluten-free bakery Flying Apron has opened in West Seattle, along with Youngstown Coffee Company and Gyro Heroes. The counter-service Wing Stop comes to Rainier Valley, and there is now bubble tea on wheels as Dreamy Drinks makes the rounds around Seattle and the Eastside. The wildly popular international chain Liuyishou Hotpot lands in Bellevue. This mainland China chain has been a big hit around North America, drawing lines up to two hours long for its beef oil spicy broth and other soups. This hot-pot spot should do well on the Eastside considering it’s so popular around Vancouver, B.C. Crossroads shopping center lands the Japanese hot pot Shabu Do, replacing Crab King. Highland Park strip mall gets The Roll Pod, which dishes Indian food that can be served in a roll or in a rice bowl. Lucky Barbecue & Noodle House specializes in Peking duck (and, ideal for this cold spell, the cooks also serve wonton soups and congee). Other openings around Bellevue: Tem Sib Thai Food Reimagined, Pho Rolls, the Japanese confection chain J.sweets and one of the odd pairings, Swan Beauty and Tea Shop, where bubble tea and desserts meet beauty parlor. Kirkland gets the Indian restaurant Cafe Bahar, which not only does biryani and goat curry but also Indo-Chinese cuisine such as Hakka noodles and chili-garlic fried rice. Burger Addict in Renton expanded to a strip mall in Kirkland, with plans to open in Auburn this year. Redmond gets more Chinese cuisine with the arrival of Chengdu noodle house Nine Way and the Hunan restaurant Dong Ting Chun. Newcastle gets Aji Sushi & Grill and MOD Pizza, and Issaquah gets Shiny Tea.